Cafe hopping is one of my favourite pastimes, especially at those themed cafes that surprise me with beautiful decors and amazing story behind its name. 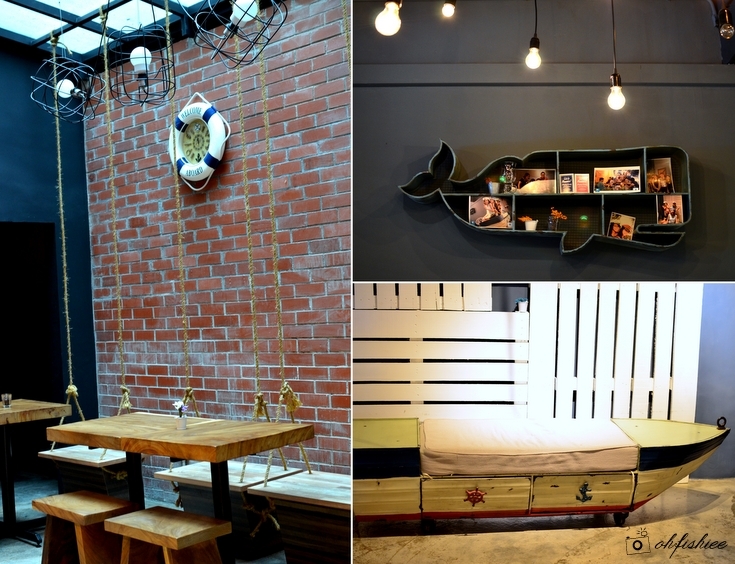 When it comes to nautical theme, Ahoy is the first that wows me with a cool vintage sailor concept. Stepping into the cafe located along the same row as Cosans Coffee, I am totally amazed by the ship and boat drawings on the wooden walls. Take a good look at the ceiling, and you'll be surprised by the creative way of hanging the light bulbs using marine ropes with tie knots. The beverages menu is equally extensive too, great for both coffee enthusiasts and casual drinkers. For now, it does not serve any hand-drip coffee but plenty of the espresso-based selections are worth trying out as it uses a blend of medium roasted beans from various origins. But since I have lower tolerance towards caffeine, I'd love to have my coffee infused with green tea and milk to exude a sweeter flavour. Thumbs up to the unique combination that I could hardly find elsewhere! I must admit that bagels are common in many cafes, but good ones are very few and far between. It is a pleasant surprise to have such perfectly baked bagel with a beautiful crisp exterior and airy light interior. The bagel itself is extra crunchy, and good to dip into the accompanying secret mayonnaise that has a bit of garlicky flavour with aroma of parsley. It tastes pretty much like sour cream to me, definitely a must-try! As for the dessert, you can request for any words to be written on your dessert plate but I am totally taken by surprise when the owner crafts my name on it. She is such a sweet lady! The rainbow mille crepe is one of the bestsellers here, because it is simply picture-perfect. I bet every girl or child couldn't resist this! Love the beautifully sheet-thin layers that melt perfectly in the mouth with subtle sweetness! Dessert wise, I'd usually go for alcoholic tiramisu, but here I notice the mille crepe here is injected with Bailey's Irish cream liqueur so I am tempted to give it a try. Topped with thick dark cocoa powder, the cake is lightly sweet and the liqueur taste is very mild. 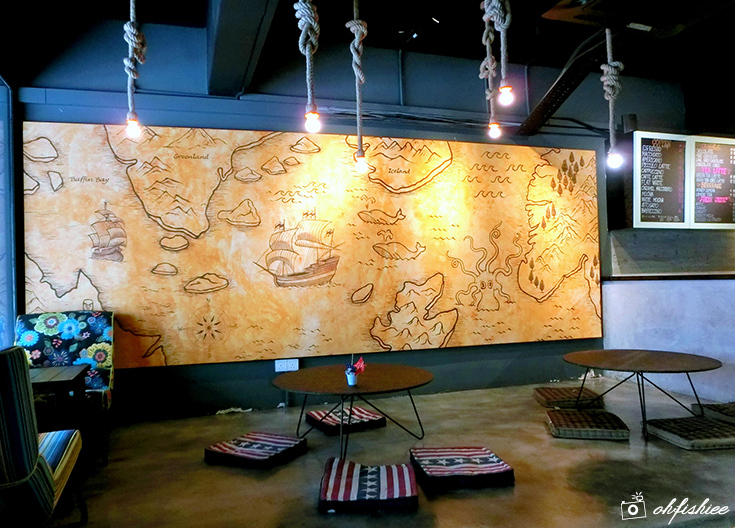 Ahoy is currently having promotions for its coffee, cakes and hot food. But if you make booking through OffPeak.my, then you can enjoy up to 20% on all the items in the ala carte menu. Don't forget to download Offpeak Mobile Apps on Apple or Android to make your booking easier! 1. Overall, I love its quiet and cosy ambiance where I can spend my whole afternoon there working or just chilling with friends. Hi may I know how does the Rainbow crepe cake taste? I mean is that has different taste as per colour? This place looks so cute!!!!! The place looks amazing! I'd like to visit once i get the chance~ salmon bagel~~ yay to kimchi combo!